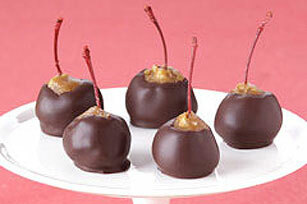 Serve up Chocolate Christmas Cherries at your party this year. Pretty maraschino cherries inside a coffee-flavored cookie crumb and walnut coating are dipped into melted chocolate to become Chocolate Christmas Cherries, an elegant holiday treat. Mix crumbs, sugar and walnuts; set aside. Add boiling water to coffee granules in small bowl; stir until coffee is dissolved. Add margarine and corn syrup; stir until well blended. Add to crumb mixture; mix well. Shape about 1 rounded teaspoonful of the crumb mixture around each cherry, leaving stem of cherry uncoated. Place in shallow pan; cover. Refrigerate 1 hour. Dip cherries, 1 at a time, in chocolate, holding cherries by the stems and turning until completely coated. Place on wire rack set over sheet of wax paper to collect drippings. Refrigerate 30 min. or until firm. Store in refrigerator. Substitute 2 cups OREO Chocolate Cookie Crumbs for the crushed vanilla wafers. Makes 3 dozen cherries or 18 servings, 2 cherries each.